I’m ba-a-a-ack. Okay, the Dude had his opportunity to expound (in great length) on the exotic travels and interesting people of a misspent youth in the company of Intrepid, an international Man of Mystery. I can’t compete. I grew up in the seventies wearing wide-legged jeans while listening to April Wine (with some Van Halen thrown in for street cred.) My biggest claim to using illicit substances was smoking Players Light when I was thirteen and getting drunk on a can-and-a-half of Pilsner beer when I was fourteen. My first travel experience couldn’t have been less adventurous. It comprised a two-week Hawaiian vacation with my best bud Wendel, complete with flowery lei’s, fruity cocktails, clean white sheets in our hotel and hours of playing pac-man in the lobby. The biggest danger we encountered was the blistering tropical sun that administered a massive burn while we rode rented mopeds around the island, resulting in two days spent in movie theatres wearing dark glasses to hide my swollen forehead and eyes. History boy leads the tourists in a rousing version of Oh Canada! Fast forward a few decades and, thankfully, our meandering vacation includes a happy medium, part adventure, part everyday living, just enough of both to keep things relaxed and interesting. My last missive related our Cape Breton adventures. 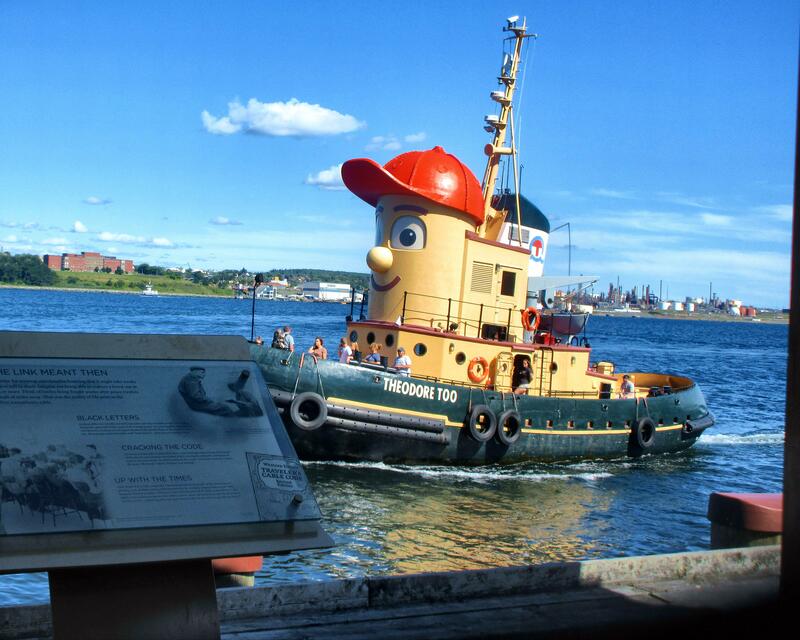 Leaving behind the comical puffins and what we now know to be an Island, we motor south to mainland Nova Scotia and the capital of Halifax, a city better named “roadwork central.” Halifax takes the Canadian summer road repair ritual to new heights. Literally every main thru-fare in the city has some form of construction going on. Traffic is grid-locked. Throw in a couple of bridges to funnel people to the city of Dartmouth across the bay and things get ugly. Thankfully Nova Scotians seem too laid-back for road rage. Traffic crawls through city streets without blaring horns, middle-finger salutes or other overt demonstrations of commuter anger. Maybe it’s because Haligonians vent their pent-up frustrations in other more violent ways. 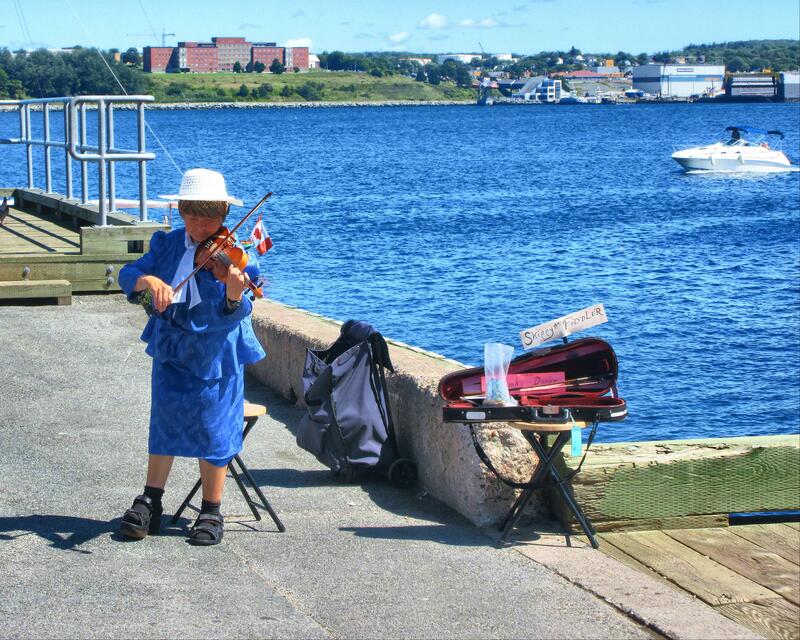 Did you know Halifax has the country’s highest per capita murder rate. During our brief stay two high profile cases dominate headlines—a pre-med student is charged with the murder of another student whose body is yet to be found; and a female Truro police officer’s body is discovered in bush beneath a bridge only minutes from the city’s downtown core. 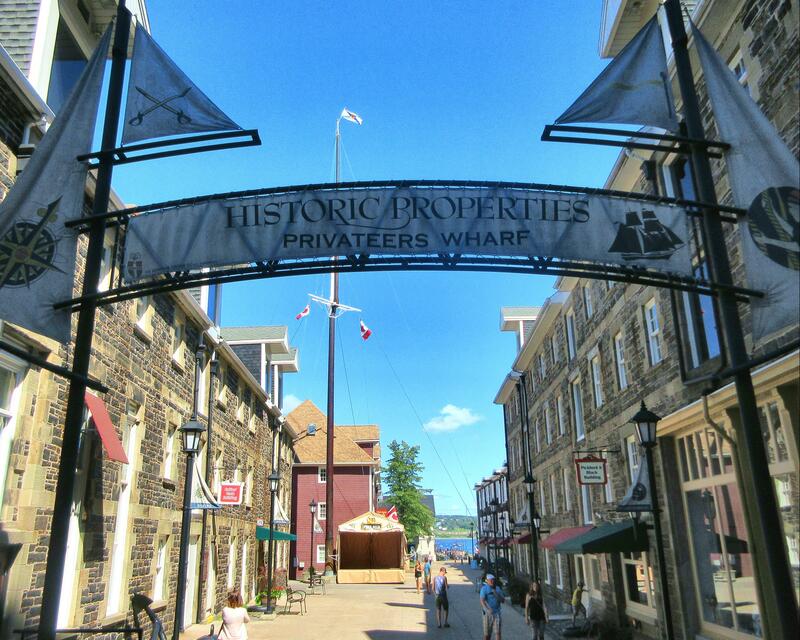 Or maybe it’s because Halifax, despite its traffic woes and murder city rep, is a lovely waterfront city crisscrossed by a mish-mash of historic tree-lined streets and down-at-the-heels neighbourhoods. 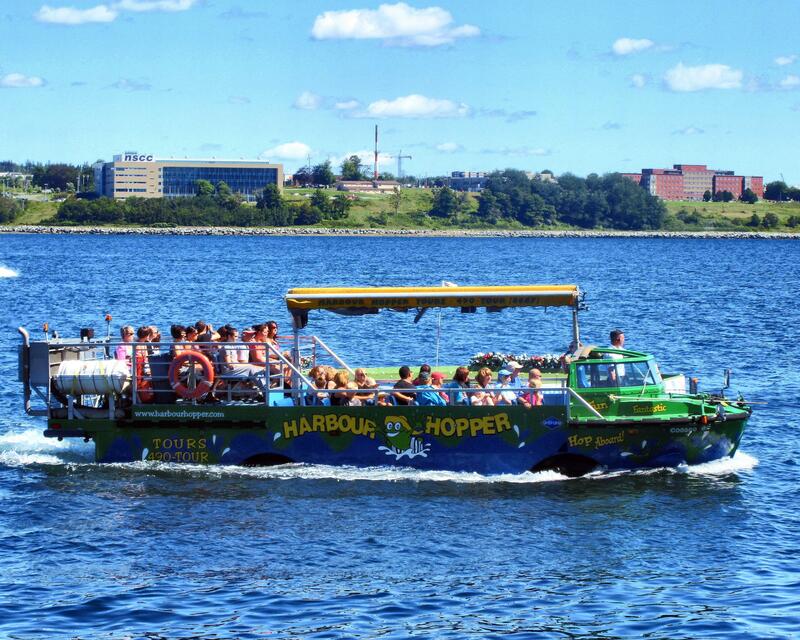 We board the Harbour Hopper, a weird-looking boat with wheels first used to transport American troops from ship to shore and from river to jungle during the Vietnam War. I doubt the Americans decorated the amphibious vehicles with bright green and yellow smiling frogs to frighten the Viet Cong (or perhaps they did, which might explain a lot about that war). 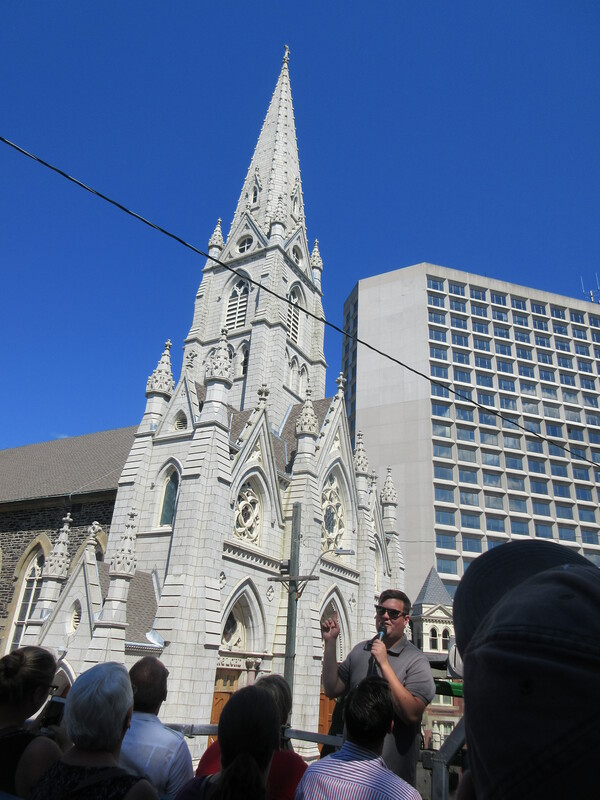 Our guide is an enthusiastic history major from Dalhousie University (a pint-sized Harvard with brick/sandstone buildings dating back to 1818). It’s always a pleasure to have a tour guide who knows his stuff and can answer obscure questions. 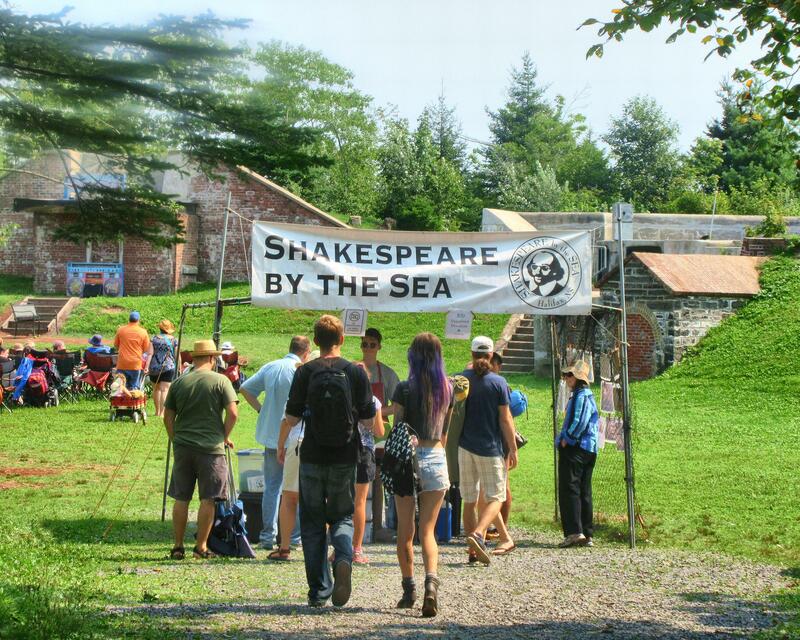 Many of these type of tours are guided by summer students who recite the memorized script and are flummoxed if you ask a question outside their comfort zone, like where to find a bathroom. 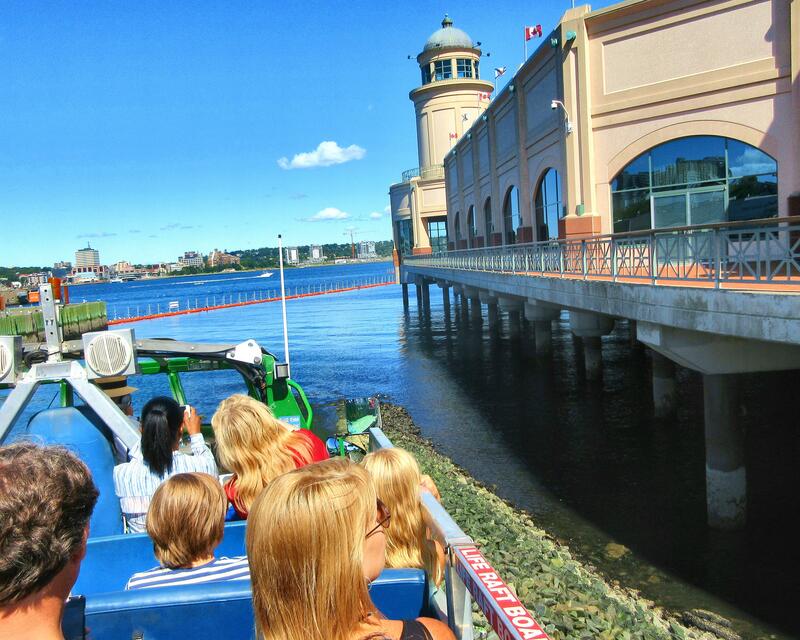 Before boarding we cruised the waterfront boardwalk with its collection of restaurants, gift shops, buskers, hordes of tourists and… nostalgia alert… a Cows outlet. You remember Cows, they of the kitschy named ice-cream and large plastic bovines outside. Sadly they were out of my favourite Don Cherry flavor. A sea salt caramel cone would have to do. Ice cream on our chins, we stop to watch glass blowers through an open door as they craft crystal beer glasses from a molten blob. The Dude’s eyes light up at the prospect of sipping suds with class but the price and his proclivity towards clumsiness when imbibing discourage a purchase. What’s with the Dude in the red Hat? 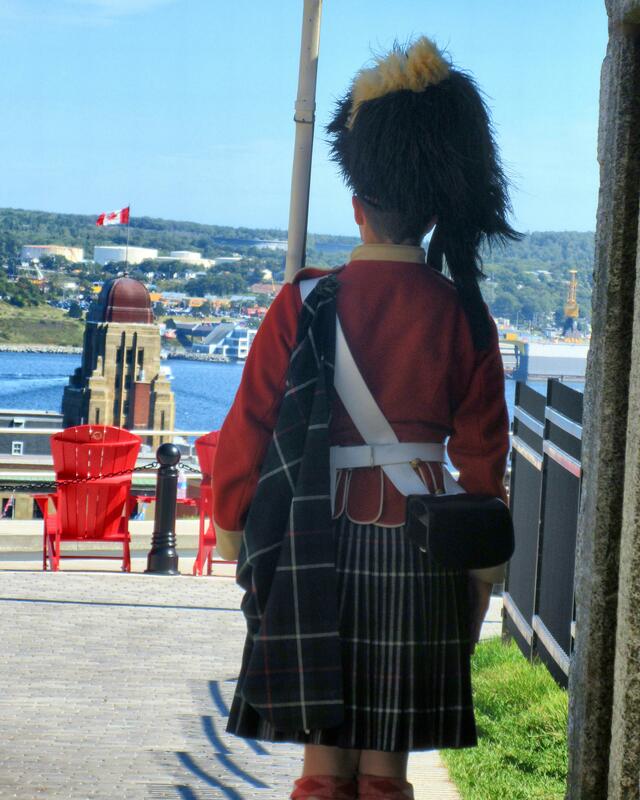 The Harbour Hopper winds its way through the streets of downtown Halifax, past the Citadel, a military fortification built in 1749 to defend Canada against attacks that never came. 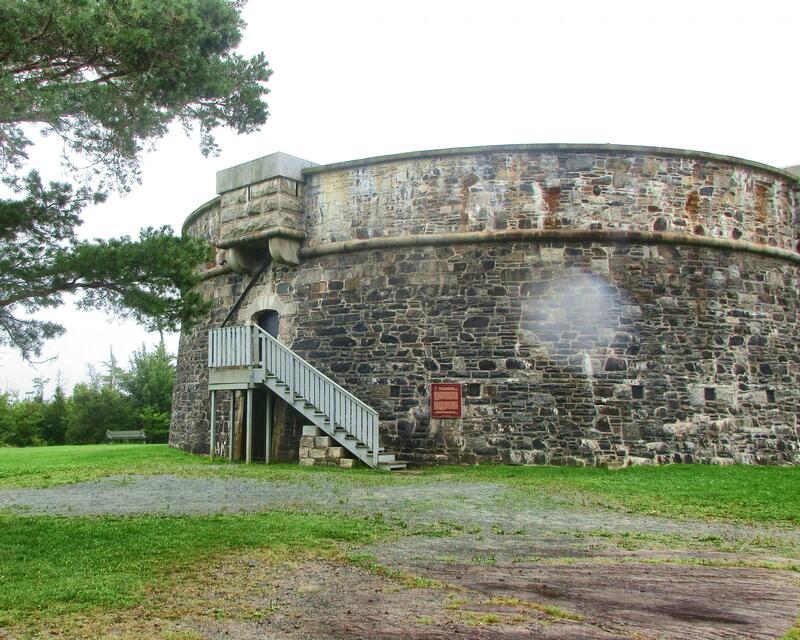 It overlooks the harbour and until recently bylaws restricted building heights so as not to obstruct the Citadel’s sightlines. Money talks, however, and a building boom has started along the waterfront (see my previous traffic comments). 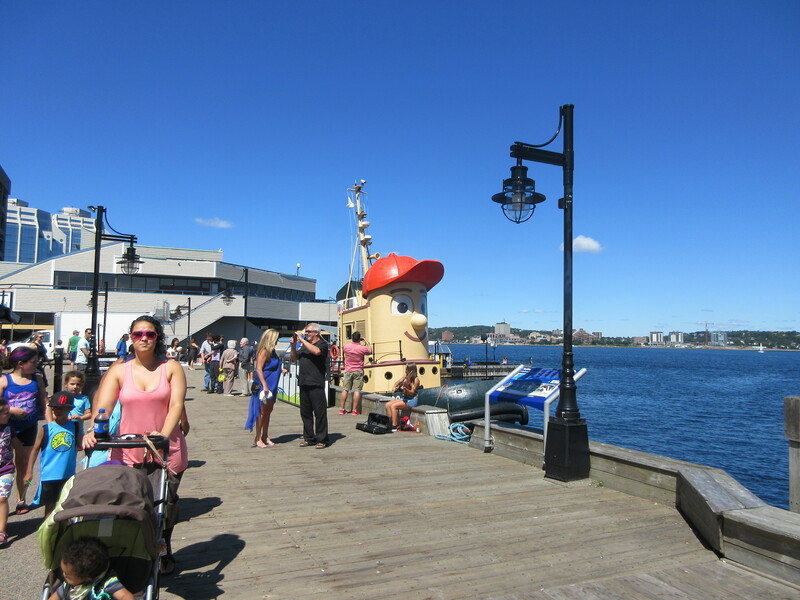 The water portion of the tour is fascinating, we enter the harbour by the Casino Nova Scotia, (gotta’ give it to the province for the snappy naming of entertainment facilities). Entering the water is relatively smooth, one minute we’re on land, the next we are getting an ocean-side perspective of the boardwalk. Our guide fascinates his captive crew with the history of the explosion of 1917, the largest in Canadian history. A French cargo ship loaded with wartime explosives collided with a Norwegian vessel in fog, the resulting blast killed more than 2,000 people, and injured 9,000 others. The explosion was so large it bared the ocean floor and caused a mini- tsunami. A half-hour later, things get a bit dicey on our return to land. A proliferation of green algae on the exit ramp make it a tad slippery. For a few tense moments it looks like The Dude and I will be swimming with the fishes. Maybe it’s part of the “scare the tourists” shtick for drumming up additional tips. 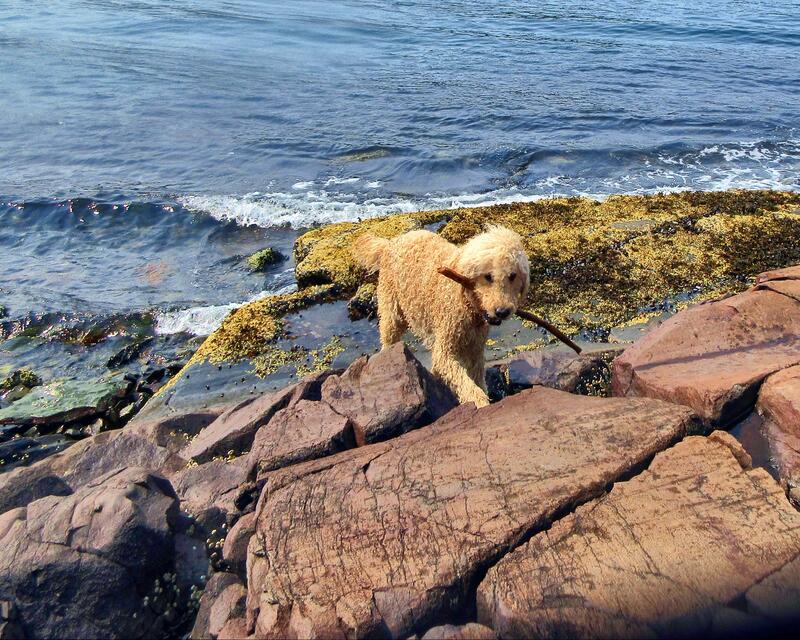 My favourite memory of Halifax is Point Pleasant Park, a swath of heavily treed paths, 90 per cent of which are off-leash. It’s dog nirvana, a meanderer’s delight, with trails snaking every which way off the main road, the only on-leash portion of the ocean-side park. Paths wind along the water and through canopies of Acadian trees. Hurricane Juan devastated the park in 2003 destroying almost three-quarters of its trees. It’s hard to believe as we walk through it. A massive replanting was undertaken and to my outsider’s eyes the trees seem to have been there for decades. There are no in-park water sources other than the ocean. Savvy pet owners carry water for their fur buddies. Shamefully I have nothing. The Dog, ever-resourceful, sniffs out the only “fresh” water source in the park, a stagnate pond near the entrance. Before I can shout “Oh no you don’t!” he leaps into the pond and sheepishly emerges, legs blackened with thick pond scum. The kind of mud that dries into a thick smelly paste and leaves crusty tracks everywhere. People and their dogs give us a wide berth as we wander the unfamiliar trails looking for a path to the ocean for a vigorous dog-dunking exercise. Minus the mud, but smelling like a seafood factory, we head back to our campground.